When I walk into a supermarket, I informally evaluate it. Is the produce fresh? Are the clerks friendly? Does it stock all of the grocery items that I regularly buy? Is the location convenient? Does it have good prices? . . . And, if it doesn’t meet my standards, I might go to a different store the next time I shop. Similarly, a hundred years ago people also evaluated their grocery stores; but that’s where the similarities end. 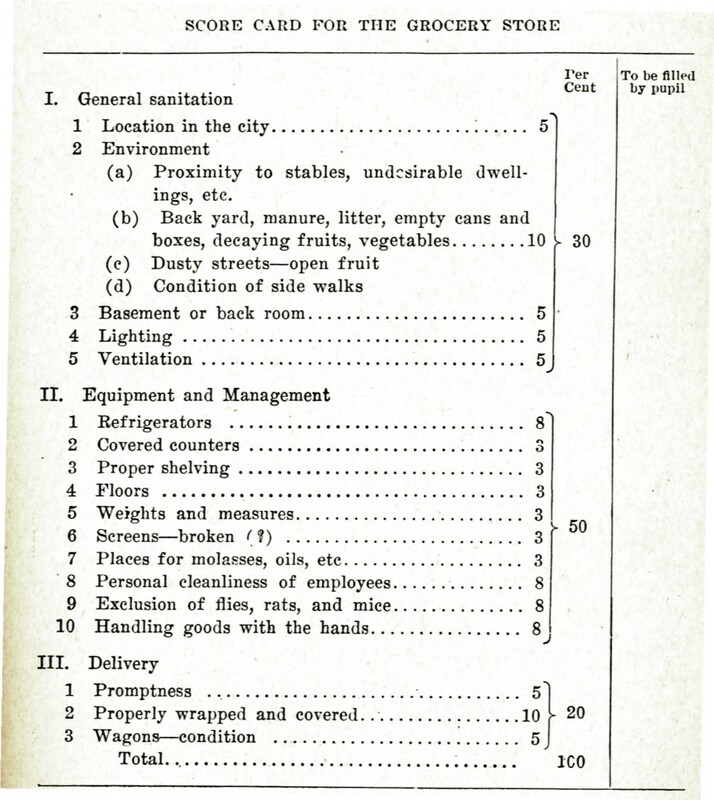 A hundred-year-old home economics textbook had a Grocery Scorecard that students could use to evaluate their grocery stores – but frankly I’ve never considered the proximity to stables, or most of the other old-time criteria. I tend to look at the past through rose-colored glasses, but when I’m honest with myself, I must admit what while some things were better a hundred years ago, I think I prefer modern food stores. We now have more standardized and strict regulations so that the health factors of our grocery stores are better. These things might be something to still look at in farm markets and roadside stands. Your comment makes me curious about whether there was any regulation of grocery stores a hundred years ago. I’m thinking that there was not – but I’m not really sure. I think we have a lot less to be concerned about. My favorite grocery store is part of a very small, independent chain. Its prices are generally a bit higher, it’s too far away to just stop for a gallon of milk, and it doesn’t have some of the items I like. On the other hand, I’m constantly evaluating the stores I go to, and that little one wins hands-down. It’s cleaner than most of our hospitals. The employees are friendly, helpful, and sometimes even fun. Most of the sackers and stockers are local high school kids who may have blue or red hair, or even a tattoo, but still are neat, clean, and polite. Best of all, I’ve never brought home sour milk, grainy ice cream, or rotten fruit from that store. Unfortunately, such experiences are all too common with the big stores. The independent chain that you describe sounds absolutely wonderful. It’s too bad that other companies don’t always have a similar culture. The attitude of the employees can really affect whether shopping is a joy or a chore. I don’t think any store these days would display decaying fruit. I hope not. You are lucky if you are generally pleased with the produce. At a store where I shop from time to time, too often fruits and vegetables that have seen better days are still for sale. The store is convenient and the prices are good, but staff are not nearly as vigilant as I think they should be at removing produce that is wilted or overripe. I didn’t know this sort of project-based teaching happened back in the early 1900s. There’s nothing new under the sun! I’m often amazed by how progressive some educators were back then. This was the era of John Dewey and others who believed that students learned best when they were actively involved in learning experiences that were practical and tied to their lives and community. It sounds more like the play store we ran in my garage when we were kids. Empty cans and boxes for sale. Milk bottle caps for change. Monopoly money. etc … I can almost relive the smell of old and musty. Your description of the play store you had in your garage makes me smile. It brings back memories of similar play stores my cousins and I created when I was a child. I’d forgotten until you mentioned it, but you’re absolutely right; grocery stores used to have a grocery store smell. I wonder why the produce is less aromatic now than what it once was. We have Publix in Florida and they are great! I also love Aldi’s and pick up some seasonal items which are good. I love your blog. It inspires me to review some of my mom’s journals of living in the Catskills after growing in the city. It’s wonderful to hear that you enjoy this blog. I have a lot of fun doing it, and it’s always nice to hear when someone likes it. You should look at your mother’s old journals. I have found my grandmother’s diary is an absolutely wonderful way to get to know her in a whole new way. Whew, it sounds like a lot of work to bring groceries home with no car – though they probably ate healthier than we do if much of their diet came from the food they raised. Another good, old thing to learn about! Now that is a different way to rate a grocery store! It’s interesting how they approached rating grocery stores. And here I didn’t realize I needed to see how far the store is from the stables! Hah, this is great, Sheryl! It’s nice to hear that you found it interesting. Wow! What an eye opening post Sheryl. All the things on the list must have been vitally important…like rats and cleanliness. How lucky we are today although I am sure there are still transgressions. I also found it eye opening. Some of things they considered when evaluating the stores a hundred years ago sure suggest that some stores had major issues. How interesting! I wonder why having a places for molasses and oils and the condition of the wagons were rated? I’m guessing that stores owned horse-drawn wagons that they used to bring food from the train station or other supply point to the store. Maybe molasses and cooking oils came in large barrels back then, and people brought their own containers to put it in when they purchased it. But that still doesn’t explain what is meant by having a place for molasses and oils – since it seems like they would have been at a certain place in the store regardless of the type of container. You’re welcome. It’s wonderful to hear that you liked this post. You are an amazing blogger. One in 100,000,000. Hope the zero’s are right. I just know you are…awesome. I’m humbled by your very kind words. I’ve enjoyed getting to know you via our blogs. Have a wonderful week-end! I have a relative that works in the grocery store business. Meeting health regulations and standards involves so many little things that we wouldn’t even normally consider. Plus you have to be on your toes to meet with customer satisfaction. I agree, I prefer the grocery stores of today. I greatly appreciate all of those little things that people do how work in grocery stores do to ensure a safe and clean store. Too often we customers don’t think about all of the important work that the workers do. Interesting. We have become so picky. A single blemish on an apple and it is set aside. I am as bad as anyone. Show me a fruit fly and I run for the door! I like how you looked at it from the perspective of the store owners back then. And, I’m sure that you’re absolutely right that it was difficult task for them to meet all of these standards. Although it’s probably beyond the food store’s control, one thing that sends me to the door is a house fly buzzing around the deli section–yuck. I have a similar reaction. Interesting to read. I think I prefer modern day supermarkets too!! It’s nice to hear that you liked this post. That’s a blast from the past!